Winter is here for the long haul, and while that may give you every excuse to hunker down with the perfect book and a steaming mug of hot cocoa, it’s also the perfect time to take on that project you’ve been pushing off for weeks: sorting through your vast collection of medical scrubs. Sure, you can simply collect all those sets you no longer use and carry them out to the trash, but why not transform them into something else you can use? While some sets of your nursing scrubs may no longer function as they were originally intended to, there’s no reason why they can’t enjoy another life. Medical scrubs today are unlike medical scrubs of the past. They come in bright, funky colors, exciting patterns and exclusive fabrics. Needless to say, though, long shifts at the hospital can do a number on even quality scrubs, and so wear and tear is quite the norm. A large stain on your top may relegate an otherwise perfectly lovely scrub set to the back of your closet, but it doesn’t have to be that way! Be creative and pull out those sewing skills your grandmother showed you when you were little. 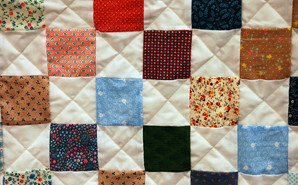 Scrubs that don’t fit you anymore make for delightful patchwork quilts which you can then drape over your couch. Simply cut out squares from varied scrub sets and get to work. If you don’t have enough scrubs to make a quilt, ask your colleagues to contribute to the cause, or you can simply make something smaller. Perhaps a pillowcase, a picnic basket liner or a fun tote bag to bring along on your next shift. If you have a little girl at home, opt for miniature doll clothes. The possibilities are endless; all you need is a needle and some thread, or a few minutes to check out Pinterest. They have a fabulous collection of how-tos for up-cycling clothing, just in case you aren’t the crafty kind. That’s right! The holidays may be over, but that doesn’t mean you can’t use these creative gift ideas year-round. By repurposing your used medical scrubs, not only will you win points for originality, but you’ll save a few dollars as well. To really give your gift that extra special touch, head out to your local craft store and pick up fabric dye in a few colors. You can transform any nursing scrubs into striking material by simply working the color. Once you’ve achieved the color of your choice, it’s time to get crafting. Are you giving a close friend an excellent bottle of wine? Why not create an equally beautiful wine cover out of your newly dyed medical scrubs pants. Simply cut off one of the pant legs to the appropriate length, sew up the bottom and use the drawstring as the bow. If you’re feeling really crafty, take some colored thread and create contrasting stitching or even a stunning monogram. Be ready to accept the compliments; they’re heading your way! Yes, you read that correctly: wear them again. Not as a medical uniform, but as pajamas. Scrubs are made from cotton and are designed to be comfortable, so why waste money on purchasing new pajamas this winter when you already have a few pairs of worn-out scrubs stored in your closet? Another option is wearing your stained scrubs as house clothes. Throw them on when you take on a painting project, get down and dirty in the garden, or when you work with any sort of material which stains. Not every nurse is fortunate enough to take a volunteer trip overseas, but there are other ways to give back. Donate your gently used medical scrubs to a medical mission going overseas to help those less fortunate than you. You can even donate your scrubs to your local Goodwill or Salvation Army. No matter what you decide to do with your used medical scrubs, make sure they are first washed very well. You do not want any disease-ridden bacteria clinging to the fabric! Once that’s done, don’t be afraid to think big or out of the box. It’s going to be a long winter, so fight the monotony of it all by making a bold statement with your upcycled scrubs! Ava Zeldes, a scrubs consultant for Medical Discount Scrubs, is dedicated to helping nurses choose top quality scrubs in cuts, patterns and colors that suit their unique style.